Rivers are like sentences. They run on. There is an order, but it can be re-arranged. They are often punctuated by geologic elements and activity. Rivers can be altered by fallen trees and jumping fish – or by human presence and activity. Alterations sometimes occur rapidly, sometimes slowly. How are those changes acknowledged? Maps help. Humans have long changed rivers to benefit themselves. We have hand-dug small irrigation canals; bull-dozed earthen levees to stop floods; and built mammoth, concrete infrastructure to stop floods, store water and produce hydropower. Think of changes wrought by global warming, its floods and its droughts. Think of the disappearance of sections or reaches of long rivers due to agricultural withdrawal for irrigation purposes. 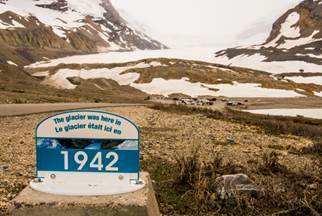 We have no substitute for today’s melting glaciers that for millennia have fed our rivers from Asia’s Himalaya Mountains to N. America’s Rocky Mountains. Glaciers supply water that we drink, that irrigates crops, that cools, and that transports us and our goods. When we were 7.3 billion people on this planet, we used the resources of 1 ½ planets. Now we are 7.7 billion people – and still increasing our numbers and resource consumption. How will that change how we live? Can we change that arc? Change can come slowly or rapidly. Change can be for the good or for the bad. Change can be invisible and unfathomable. Click here to read more and see photos.